Sometimes you just need fried pickles, and our Bread and Butter Pickles make an excellent base! Made with local wildflower honey and no added sugar, these bad boys are certain to make your tastebuds dance. 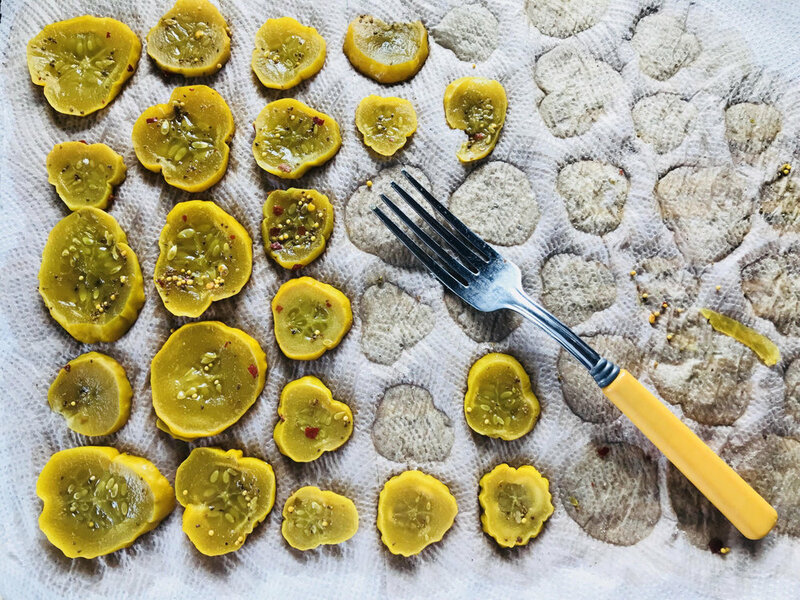 Using Maine heirloom cucumber varieties like Boothby Blondes, these pickles are crisp, classic, and delicious. These crispy tangy greats are so easy and so enjoyable. First take a jar of Bread and Butter pickles and strain all the liquid out. Lay the pickles out on paper towels and pat dry. The drier the pickle slices are the better the flour mix (I used flour, garlic powder, and a little spice) will bind to them! Next, bring a high heat frying oil up to temperature in a pan (I like using safflower oil as it has a high smoke point and a mild flavor). Working in batches, add pickles to a bowl of flower and gently toss to coat. Move the pickles from the flour mixture to the oil and fry until crispy and golden. Using a slotted spoon to get the pickles out of the oil, move them to a paper towel covered plate to cool briefly. Whip up a dipping sauce of choice (I went with a sage and garlic sour cream sauce), and enjoy those tempting and crunchy fried pickles!